In our “24 Hours In” series, we present good ideas of what to do in the featured city over a full day. 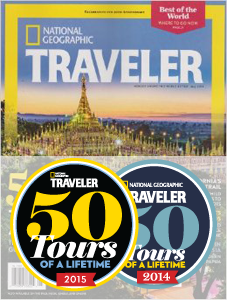 The destinations we’ll be covering include cities that are often traveled through, but not in. These cities often act as international flight hubs, and layovers can extend from hours to a full day at times. So if you’re in a city on your way to or from your destination, following are some of our favorite things to do there! Have 24 hours to spend in Singapore during Indonesia tours? Well hold onto your hats friends, because you are in for a wild ride. Ever since the first boats were traveling back and forth through the seas of Southeast Asia, Singapore has been a hub of international travelers. Traders realized the value of this island’s real estate very quickly, but it wasn’t until the British colonized the place in the 19th century that the Singapore we know today was born. 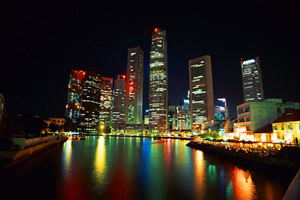 Since its independence from foreign rule in 1963, and subsequent full sovereignty in 1965, Singapore has boomed as an international trade and travel hub. One of the wealthiest, most diverse, and modern cities in the world, Singapore is an extreme contrast with most of the Asian continent. The city’s image is that of a business-oriented, overly-clean, state-run shopping mall, but if you chip away the lacquer, you will find a vibrant, crunchy center of culture worthy of its Chinese, Malaysian, Indian, and Western roots. In 1963, most new Singaporean citizens were Chinese, Indian and Malaysian immigrants brought in by the British government for hard labor. Enough time to fully mesh these cultures has not yet passed, and Singapore remains a diverse nation of immigrants. Though about 75% of its citizens are Chinese, one must remember that over a third of Singapore’s residents are not citizens at all. This is a true international city; religions, languages, and cultures come by the dozen. Flying into Singapore is one of the more pleasurable travel experiences; its international airport is one of the nicest in the world. 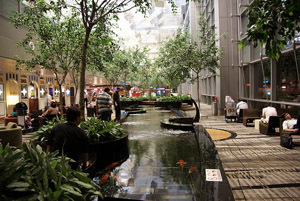 Singapore has no delusions about its status as a frequent layover hub, and its airport has tons of features to keep travelers busy for hours, including a movie theater, a large indoor garden, a video game lounge, and more than a few bars and restaurants. Really, it is an ideal place to spend a layover under five hours long. Even if your layover is 5-6 hours long, you can stop reading this guide now. Once the airport manages to bore you, the airport itself offers free tours of the city several times a day. You can sign up at the Free Singapore Tours booths in Terminals 2 and 3. For those of you still reading, following is the rest of the city. Singapore’s government has recently striven to leave behind its reputation as a sterile metropolis with mixed results. Two fully equipped casinos were allowed on the island in 2010 (there goes your 24 hours! ), and the arts have been openly invited into the city. Even the newly opened theaters and galleries have an air of “government sanctioned” however, and a true bohemian culture has yet to flourish here. For being an icon of urban development, Singapore has a surprising amount of outdoor activities to keep you busy. 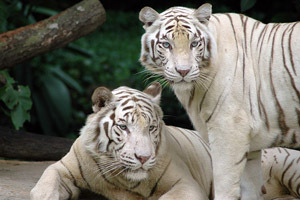 Singapore’s zoo is one of the best in the world, featuring rare Asian species unlikely to be found in captivity anywhere else. Near the zoo is the Bukit Timah Nature Reserve, which features more plant species than the whole North American continent. Plenty of water sports, golfing, and even an indoor skiing center can keep more active travelers happy for a long time. For beach-lovers, Sentosa is an islet separate from Singapore and a popular weekend getaway for both locals and tourists. Once a military fortress in WWII, the islet has been transformed into a center of entertainment overload. A huge tropical oceanarium, the city’s first casino, and Universal Studios Singapore are all here, in addition to large, usually packed public beaches. If you’re around on the weekend, be sure to attend one of Singapore’s infamous foam parties, (when the government is inclined to let them happen.) Other than taxis, all transportation on Sentosa is 100% free. If eating is one of Singapore’s national pastimes, the other is shopping. Expensive by Asian standards, Singapore is still a very affordable city for most western travelers. This is not the Asian country to find locally-made handicrafts. Shopping malls are national monuments here, and if you can think of it, there is probably a store in Singapore that sells it. The Riverside district is particularly known for its miles of shopping. When it comes to clothes, keep in mind that you are just off the equator here, and that most Singaporeans wear skimpy clothing and flip flops pretty freely. However, it also rains almost every day, so you may want to have an umbrella handy. If you’re having problems finding good food in Singapore, frankly, you’re doing something wrong. Eating is the national activity. For locals, if anything is worth doing, it is worth doing in a restaurant. 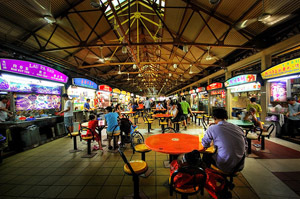 Knowing its population’s diversity, one can only imagine the unique nature of Singapore’s gastronomic landscape. Foods remain mostly distinctly divided by culture of origin, and you can be sure that an Indian restaurant in Little India is exactly that. However, a new hybrid Peranakan cuisine has grown in popularity, and unique “Singaporean food” eateries have begun to pop up here and there. Eating street food in Singapore is one of those traveler bucket list items along with taking a gondola ride in Venice or playing a hand of blackjack in Vegas. If you want to lose your 24 hours in a haze of food-colored ecstasy, find the nearest “hawker center.” Singapore used to be known for its predominant food carts making the world’s best street food, but the government corralled the city’s food carts into these designated centers, simultaneously cleaning up the city’s image and making it convenient to find all the food you could ever want in one place.